CD25+CD4+ T cells are naturally occurring regulatory T cells that are anergic and have suppressive properties. Although they can be isolated from the spleens of normal mice, there are limited studies on how they can be activated or expanded in vivo. We found that oral administration of OVA to OVA TCR transgenic mice resulted in a modification of the ratio of CD25+CD4+ to CD25−CD4+ cells with an increase of CD25+CD4+ T cells accompanied by a decrease of CD25−CD4+ T cells. The relative increase in CD25+CD4+ T cells persisted for as long as 4 wk post feeding. We also found that CTLA-4 was dominantly expressed in CD25+CD4+ T cells and there was an increase in the percentage of CD25+CD4+ T cells expressing CTLA-4 in OVA-fed mice. In contrast to CD25−CD4+ cells, CD25+CD4+ cells from fed mice proliferated only minimally to OVA or anti-CD3 and secreted IL-10 and elevated levels of TGF-β1 following anti-CD3 stimulation. CD25+CD4+ cells from fed mice suppressed the proliferation of CD25−CD4+ T cells in vitro more potently than CD25+CD4+ T cells isolated from unfed mice, and this suppression was partially reversible by IL-10 soluble receptor or TGF-β soluble receptor and high concentration of anti-CTLA-4. With anti-CD3 stimulation, CD25+CD4+ cells from unfed mice secreted IFN-γ, whereas CD25+CD4+ cells from fed mice did not. Adoptive transfer of CD25+CD4+ T cells from fed mice suppressed in vivo delayed-type hypersensitivity responses in BALB/c mice. These results demonstrate an Ag-specific in vivo method to activate CD25+CD4+ regulatory T cells and suggest that they may be involved in oral tolerance. The immune system has evolved a number of mechanisms to control self-reactive T cells that escape negative selection in the thymus. However, T cell nonresponsiveness to self-Ags does not appear to result exclusively from clonal deletion, T cell anergy, or T cell ignorance. Accumulating evidence suggests that regulatory T cells play an important role in controlling self-reactive T cells and in maintaining immunologic self-tolerance (1, 2, 3, 4, 5, 6, 7). A large number of recent studies have focused on self-tolerance as maintained by CD25+CD4+ regulatory T cells, which constitute 5–10% of peripheral CD4+ T cells in normal naive mice (1, 8, 9, 10, 11, 12, 13, 14, 15, 16, 17, 18, 19, 20, 21, 22, 23, 24). Depletion of CD25+CD4+ T cells from mice induces autoimmune diseases such as gastritis, oophoritis/orchitis, thyroiditis, or pancreatitis (25). Furthermore, transfer of CD25+CD4+ T cells from normal naive mice can prevent autoimmune disease (8, 10, 25). CD25+CD4+ T cells in normal naive mice are nonresponsive to Ag-specific stimulation in vitro, and, upon stimulation through the TCR, potently suppress the activation of other CD4+ T cells in an Ag-nonspecific manner (11, 25). Although cell-cell contact has been proposed as one of the mechanisms (10, 11), the role of IL-10 and TGF-β in CD25+CD4+ T cell-mediated suppression remains to be determined because CD25+CD4+ T cells contain mRNA for IL-4, IL-10, and TGF-β (8). Oral tolerance refers to systemic Ag hyporesponsiveness that occurs after oral Ag administration and can occur by multiple mechanisms (26, 27). One of the major mechanisms of oral tolerance is the induction of regulatory CD4+ T cells that mediate active suppression by producing immunomodulatory cytokines such as IL-4, IL-10, and TGF-β, with a unique role for TGF-β (6, 28). Oral tolerance is effective in suppressing animal models of autoimmune diseases, such as experimental autoimmune encephalomyelitis, uveitis, arthritis, and diabetes, and is also being tested in human autoimmune diseases (reviewed in Ref. 27). Transfer of CD4 T cells from myelin basic protein (MBP)3-fed mice prevents experimental autoimmune encephalomyelitis induced by immunization with MBP in MBP transgenic (Tg) mice (29). Given that oral tolerance is a crucial immunologic process associated with the absorption and processing of proteins via the gut-associated lymphoid tissue and that CD25+CD4+ cells appear to be a biologically important class of regulatory cells, we asked whether oral Ag administration activated CD25+CD4+ regulatory T cells in vivo. OVA TCR Tg mice on the BALB/c background, clone DO11.10, which recognizes the 323–339 peptide fragment of OVA, were originally obtained from Dr. K. Murphy (30) and housed under specific pathogen-free conditions in the Animal Resource Facility of Harvard Medical School. Tg mice (6–8 wk old) were used throughout the studies. Tg mice were typed by staining peripheral blood leukocytes with FITC-conjugated anti-clonotype-spcific mAb KJ 1-26 (Caltag Laboratories, Burlingame, CA) and PE-conjugated anti-CD4 mAb (BD PharMingen, San Diego, CA). Female BALB/c mice (6–8 wk old) were purchased from The Jackson Laboratory (Bar Harbor, ME). DO11.10 or BALB/c mice were immunized s.c. at the flank with 100 μg of OVA (Sigma, St. Louis, MO) in 50 μl of PBS and 50 μl of CFA containing 200 μg of Mycobacterium tuberculosis (H37Ra; Difco, Detroit, MI), or i.v. injected with 25 mg of OVA once. OVA TCR Tg mice (6–8 wk old) were fed 20 mg/ml OVA or 20 mg/ml BSA (Sigma) in the drinking water for 5 days. Abs used in cell staining were purchased from BD PharMingen: biotinylated anti-CD25 (7D4), PE-conjugated anti-CD25 (PC61), PE- or FITC-conjugated anti-CD4 (L3T4), FITC-conjugated anti-CD62 ligand (anti-CD62L) (MEL-14), FITC-conjugated anti-CD69 (H1.2F3), FITC-conjugated anti-CD44 (IM7), FITC-conjugated anti-CD45RB (16A), purified anti-CD3ε (145-2C11), purified anti-CD28 (37.51), and purified anti-FcR. Anti IL-10 and anti TGF-β1 blocking Abs, recombinant mouse IL-10 soluble receptor (sR), recombinant human TGF-β sRII/Fc chimera, human IL-3 sR, and human TNFRI/Fc chimera were purchased from R&D Systems (Minneapolis, MN). Three-color flow cytometry was performed as previously described (31). Briefly, 0.5–1 × 106 cells in 50 μl from spleens or lymph nodes, or purified T cells from spleens or lymph nodes, were incubated in staining buffer (PBS with 4% BSA and 0.1% sodium azide) for 5 min. The cells were then stained with biotinylated mAb in staining buffer for 30 min, washed twice, then incubated with a mixture of PE- and FITC-conjugated mAb (0.5 μg/sample), streptavidin-RED670 (1 μl/sample; Life Technologies, Rockville, MD), or FITC-conjugated streptavidin (BD PharMingen) for 30 min. The cells were washed twice and then fixed in PBS with 1% formaldehyde. The analysis was performed on a FACScan flow cytometer with CellQuest software (BD Biosciences, Mountain View, CA). All procedures were performed on ice until analysis. For analysis of intracellular CTLA-4, sorted CD25+CD4+ or CD25−CD4+ T cells were fixed with Cytofix/Cytoperm solution (catalog no. 2075KK; BD PharMingen) according to the suggested protocol and then incubated with PE-conjugated anti-CD25 (1 μg/106 cells) on ice for 30 min in the dark. Cells were washed and analyzed immediately by flow cytometry. Spleens and lymph nodes (axillary, inguinal, and mesenteric) were removed from OVA TCR Tg mice and prepared into single cell suspensions. CD4+ T cells were isolated using T cell subset columns (R&D Systems) according to the suggested protocol. To separate CD25+CD4+ T cells and CD25−CD4+ T cells, the enriched CD4+ T cells were incubated with biotin-conjugated anti-CD25 (10 μg/108 cells) in staining buffer on ice for 30 min, and washed twice. The cells were then incubated with FITC-conjugated streptavidin (10 μg/108 total cells) on ice for another 30 min. Finally, CD25+CD4+ T cells and CD25−CD4+ T cells were sorted by flow cytometry on a FACStar cell sorter (BD Biosciences). In adoptive transfer of experiments, purified CD4+ T cells were incubated with biotin-conjugated anti-CD25 (10 μg/108 cells) on ice for 30 min, followed by streptavidin MicroBeads (Miltenyi Biotec, Auburn, CA) for 15 min at 4°C. Magnetic separation was performed with a LS+ positive selection column according to the suggested protocol. Splenocytes from unfed OVA TCR Tg mice were incubated with anti-Thy 1.2 culture supernatants (HO-13.4) for 30 min on ice, followed by treatment with rabbit complement (Accurate Chemical and Scientific, Westbury, NY) for 45 min at 37°C. The procedure was repeated a total of two times for each experiment. Proliferation assays were performed as previously described (32). Briefly, CD25−CD4+ T cells were cultured with 200 μg/ml OVA for 72 h in U-bottom 96-well plates at 5 × 104/well with the indicated numbers of CD25+CD4+ T cells and 1 × 105 cells/well of APC, in DMEM supplemented with 10% heat-inactivated FBS (BioWhittaker, Walkersville, MD), 2 mM l-glutamine, 100 U/ml penicillin, 100 μg/ml streptomycin, and 50 μM 2-ME (Sigma). Cultures were pulsed with 1 μCi of [3H]TdR per well (NEN, Boston, MA) 72 h later and harvested 16 h later. For splenocytes, cells were cultured in 96-well plates at 5 × 106 cells/ml in complete DMEM, pulsed with [3H]TdR 48 h later, and harvested 16 h later. For cytokine assays, splenocytes were cultured at 1 × 106 cells/well in 200 μl of Ex Vivo 20 medium (BioWhittaker) with various Ag concentrations. Supernatants were collected after 24 h for IL-2, 48 h for IL-4, IL-10, and IFN-γ, and 72 h for TGF-β1. Purified CD25+CD4+ and CD25−CD4+ T cells were cultured in 48-well plates (0.5 ml) at 2 × 106/ml in Ex Vivo 20 medium and stimulated with 10 μg/ml plate-bound anti-CD3 mAb alone or plus anti-CD28 mAb (5 μg/ml). Supernatants were collected 48 h after culture. Quantitative ELISA for IL-2, IL-4, IL-10, and IFN-γ were performed using paired Abs and recombinant cytokines from BD PharMingen per the manufacturer’s recommendations. TGF-β1 was measured by TGF-β1 Emax ImmunoAssay System (Promega, Madison, WI). Briefly, the flat-bottom 96-well plates were coated overnight at 4°C with mouse anti-TGF-β1 mAbs in 100 μl of 0.1 N carbonate buffer, pH 8.2. The plates were then washed three times with PBS containing 0.05% Tween 20, and blocked with 1% BSA in PBS. After washing, the plates were incubated with culture supernatants that were treated with 2 μl of 1 N HCl at room temperature for 15 min followed by the addition of 2 μl of 1 N NaOH overnight at 4°C. The plates were washed again and incubated with rabbit anti-TGF-β1 polyclonal Ab for 2 h at room temperature, followed by anti-rabbit IgG HRP for 1 h. Color was developed with one component tetramethylbenzidine reagent (Kirkegaard and Perry Laboratories, Gaithersburg, MD). CD25+CD4+ and CD25−CD4+ T cells from unfed or OVA-fed OVA TCR Tg mice were purified by MACS and immediately injected i.v. into 6- to 8-wk-old BALB/c mice at 1 × 106 cells/mouse. One day after transfer, the mice were immunized in the footpad with 100 μg of OVA in 0.1 ml of CFA containing 200 μg of M. tuberculosis. Thirteen days after immunization, mice received s.c. injections of 20 μl of OVA (1 mg/ml in PBS) in the left ear and 20 μl of PBS in the right ear. Ear thickness was measured 24 h later in a blinded fashion using a calipermeter (Mitutoyo, Osaka, Japan). Results are shown as the differences between the left and right ear thickness. Differences in the percentages of T cells and ear thickness in mice were analyzed for significance using Student’s t test. We asked whether oral administration of Ag was associated with changes in CD25−CD4+ or CD25+CD4+ T cells. To address this question, 6- to 8-wk-old OVA TCR Tg mice were fed with 20 mg/ml OVA or BSA in the drinking water and sacrificed at day 6. Lymphoid cells in inguinal lymph node (ILN), mesenteric lymph node (MLN), Peyer’s patches (PP), and spleens from these mice were analyzed by flow cytometry. We found a significant decrease in the percentage of CD4+ T cells in OVA-fed mice in ILN, MLN, and spleen, but not in the control mice fed BSA (Table I⇓). In terms of CD25+ and CD25− cells, OVA feeding resulted in significantly reduced numbers of CD25−CD4+ T cells in spleen, ILN, and MLN of OVA-fed mice. At the same time, the percentage of CD25+CD4+ T cells increased in OVA-fed mice compared with controls (Table I⇓, Fig. 1⇓A). PP from OVA-fed mice showed no significant change in the percentage of CD4+, CD25−CD4+, or CD25+CD4+ T cells at day 6, as compared with control. Analysis of CD25+CD4+ and CD25−CD4+ T cells in lymphoid cells by flow cytometry. A, OVA TCR Tg mice were fed 20 mg/ml BSA (BSA-fed) or 20 mg/ml OVA (OVA-fed) in the drinking water for 5 days. On day 6, lymphoid cells from ILN, MLN, and splenocytes were prepared and stained for CD25 and CD4. B, OVA TCR Tg mice were fed 20 mg/ml BSA or 20 mg/ml OVA for 5 days. CD4+ T cells from ILN, MLN, and spleens were combined and isolated using a mouse T cell subset column and then stained for CD25 and CD4. C, OVA TCR Tg mice were fed 20 mg/ml BSA or 20 mg/ml OVA for 5 days. Four weeks after the last feeding, lymphoid cells from ILN and MLN were prepared and stained for CD25 and CD4. For staining PE-conjugated anti-CD25 and FITC-conjugated anti-CD4 were used, and cells were collected and analyzed by flow cytometry. The results are representative of four independent experiments described in Table I⇓. To rule out the possibility that the increase in the percentage of CD25+CD4+ T cells in lymphoid cells from OVA-fed mice was simply due to the decrease in CD25−CD4+ T cells, we purified CD4+ T cells and measured the percentage of both CD25+CD4+ and CD25−CD4+ T cells within the purified CD4 T cell population as well as the absolute numbers of CD25+CD4+ T cells in the spleens. As shown in Fig. 1⇑B, there was a 3-fold increase in CD25+CD4+ T cells within the purified CD4+ T cells in OVA-fed mice as compared with BSA-fed mice (13.3 vs 4.3%). We also found significantly increased absolute numbers of CD25+CD4+ T cells in the spleens from OVA-fed mice as compared with those from unfed mice (29.7 ± 8.9 × 105 vs 13.1 ± 4.4 × 105, p < 0.01). Furthermore, this increase in the percentage of CD25+CD4+ T cells persisted in MLN and ILN from OVA-fed mice for as long as 4 wk postfeeding (Fig. 1⇑C), at a time when the percentages of CD25−CD4+ T cells returned to their prefed values (62% in ILN and 59% in MLN). Similar activation of CD25+CD4+ T cells was observed when 1 mg of OVA323–339 peptide was used for feeding and in vitro stimulation (data not shown). No significant changes were observed in OVA TCR Tg mice fed 20 mg/ml BSA. To determine whether the changes we observed occurred on clonotype-positive cells, we measured the percentage of KJ1-26+ and KJ1-26−CD25+ T cells within the CD4 subset after feeding. Lymphoid cells from unfed (water), BSA-fed, or OVA-fed mice were stained with anti-CD4, anti-CD25, plus anti-clonotype TCR (KJ1-26). As shown in Table II⇓, we found a significant increase in the percentages of KJ1-26+CD25+CD4+ T cells in ILN, MLN, and spleen from OVA-fed mice, whereas the percentages of KJ1-26−CD25+CD4+ T cells did not change significantly. Thus, oral administration of Ag expanded clonotype-specific CD25+CD4+ T cells. We then performed kinetic analysis of CD25+CD4+ and CD25−CD4+ T cell populations in lymphoid tissues during feeding. As shown in Fig. 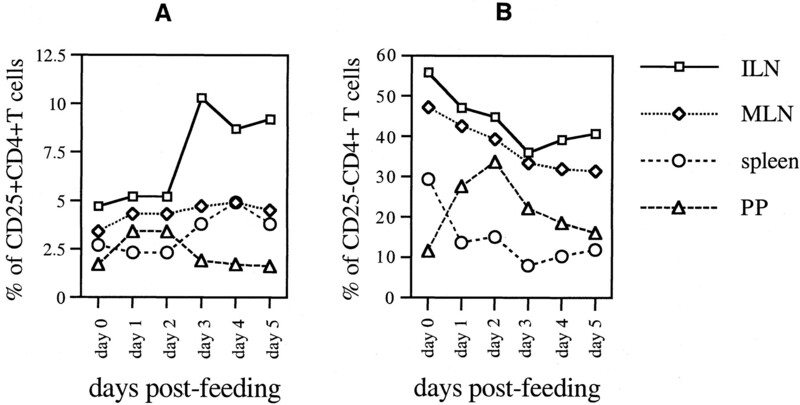 2⇓A, CD25+CD4+ T cells increased in the PP on days 1 and 2 of feeding after which they returned to baseline levels. A large increase of CD25+CD4+ T cells was observed in the ILN beginning on day 3, at which time an increase in the spleen and MLN was also seen. For CD25−CD4+ T cells (shown in Fig. 2⇓B), a decrease was observed in all tissues following feeding except for PP where cells increased on days 2 and 3, after which they declined. Kinetic analysis of CD25+CD4+ T cells (A) and CD25−CD4+ T cells (B) in lymphoid organs from OVA-fed mice. Eight-week-old OVA TCR Tg mice were fed 20 mg/ml OVA in drinking water. Lymphoid cells from ILN, MLN, spleen, and PP were collected on the indicated days post feeding, stained with PE-conjugated anti-CD25 and FITC-conjugated anti-CD4, and then analyzed by flow cytometry. The results represent the mean values from three independent experiments with eight mice in each group. We also investigated whether CD25+CD4+ T cells could be activated under other in vivo conditions. We found no significant expansion of CD25+CD4+ T cells in OVA TCR Tg mice measured on days 6 and 13 after immunization with 100 μg of OVA in CFA or after feeding a lower dose in the drinking water (1 mg/ml). However, CD25+CD4+ T cells could be activated when OVA TCR Tg mice were gavaged with 25 mg of OVA daily for 5 days (data not shown). We did not observe an increase in CD25+CD4+ T cells in BALB/c mice after feeding, immunization, or combination of feeding plus immunization. Interestingly, we found that in OVA TCR Tg mice injected i.v. with 25 mg of OVA, CD25+CD4+ T cells comprised 65% of CD4 T cells measured 1 day postinjection. However, the percentage of CD25+CD4+ T cells returned to the normal level (5%) on day 6. Furthermore, the CD25+CD4+ T cells isolated on day 1 did not suppress the proliferation of CD25−CD4+ T cells from either naive or OVA-injected mice (data not shown). We also did not observe an increase of CD25+CD4+ T cells in spleen or lymph nodes when soluble Ag was given i.p. or s.c. (data not shown). To further characterize the CD25+CD4+ T cells from OVA-fed OVA TCR Tg mice, CD4+ T cells were isolated on a T cell subset column and sorted on the basis of surface CD25 expression. The resulting purity of the sorted CD25+CD4+ T cells or CD25−CD4+ T cells was 98%. We then tested the CD25+CD4+ and CD25−CD4+ populations for expression of CD69, CD62L, and CD44 pre- and postfeeding. As shown in Fig. 3⇓, a higher proportion of CD25+CD4+ T cells from fed mice expressed CD69 as compared with the cells from unfed mice. Approximately 60% of CD25−CD4+ T cells expressed CD69 after feeding. Both CD25+CD4+ and CD25−CD4+ T cells from fed mice had down-regulation of CD62L and up-regulation of CD44 as compared with unfed mice. Characterization of CD25+CD4+ and CD25−CD4+ T cells. Purified CD4+ T cells were stained with PE-conjugated anti-CD25, then sorted by a FACScan cell sorter. 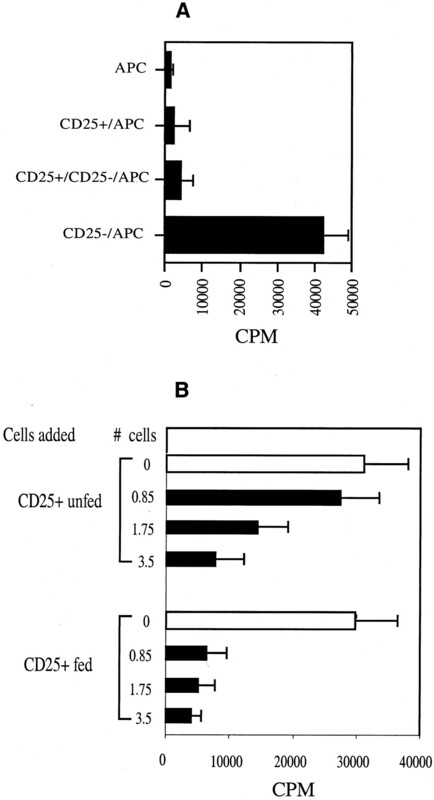 The purified CD25+CD4+ and CD25−CD4+ T cells were stained for CD69, CD62L, and CD44. Plain lines represent the cells isolated from unfed mice. Bold lines represent cells from OVA-fed mice. The data are representative of three independent experiments. To functionally characterize CD25+CD4+ T cells from OVA-fed mice, we measured proliferative responses in vitro and the ability of CD25+CD4+ T cells to act as regulatory cells. As shown in Fig. 4⇓A, there were only minimal proliferative responses in vitro when CD25+CD4+ T cells were stimulated with OVA plus APC, whereas CD25−CD4+ T cells from fed mice had prominent proliferative responses. Furthermore, although CD25+CD4+ T cells from OVA-fed mice showed minimal proliferative responses to OVA, they completely suppressed the proliferation of CD25−CD4+ T cells from fed mice when both populations were cultured in a 1:1 ratio (Fig. 4⇓A). CD25+CD4+ T cells purified from OVA-fed mice are minimally responsive to OVA and suppress CD25−CD4+ T cells from both OVA-fed and unfed mice. A, CD25+CD4+ T cells, CD25−CD4+ T cells (5.0 × 104/well), or both populations mixed at an equal ratio were purified from OVA-fed OVA TCR Tg mice (20 mg/ml OVA in drinking water for 5 days) and were incubated with APC (1 × 105/well) in the presence of 200 μg/ml OVA. 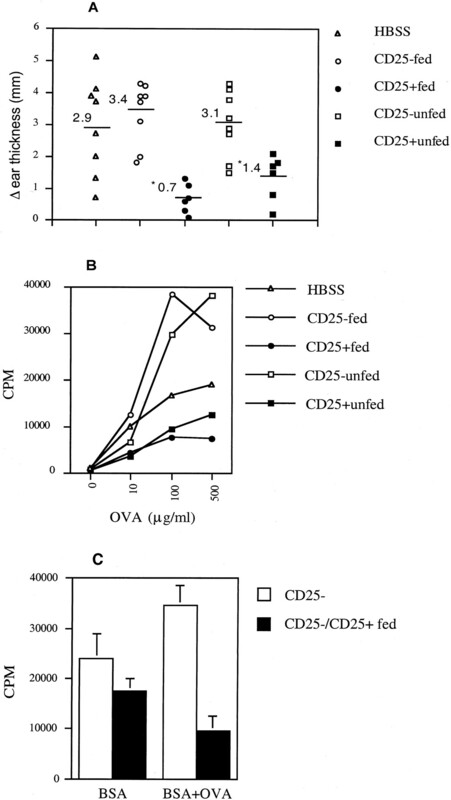 B, CD25−CD4+ T cells (5 × 104/well) were purified from unfed OVA TCR Tg mice, then cultured alone or with the indicated numbers of CD25+CD4+ T cells (0.85, 1.75, or 3.5 × 104/well) isolated from unfed mice or OVA-fed mice (20 mg/ml OVA in drinking water for 5 days) in the presence of APC (1 × 105/well) and 200 μg/ml OVA for 72 h. Results are mean ± SD of triplicate cultures from three independent experiments. We then directly compared the ability of CD25+CD4+ cells from either fed or unfed mice to suppress CD25−CD4+ cells by adding increasing numbers of CD25+CD4+ cells from unfed or fed mice to a constant number of CD25−CD4+ cells from unfed mice. As shown in Fig. 4⇑B, CD25+CD4+ T cells from OVA-fed mice were more potent at suppressing the proliferation of CD25−CD4+ T cells than CD25+CD4+ T cells from unfed mice. When 0.85 × 104 CD25+CD4+ T cells from OVA-fed mice were added to 5 × 104 CD25−CD4+ cells, there was a 75% decrease in proliferative responses, whereas with the same number of CD25+CD4+ cells from unfed mice, proliferative responses were decreased only by 12.5%. 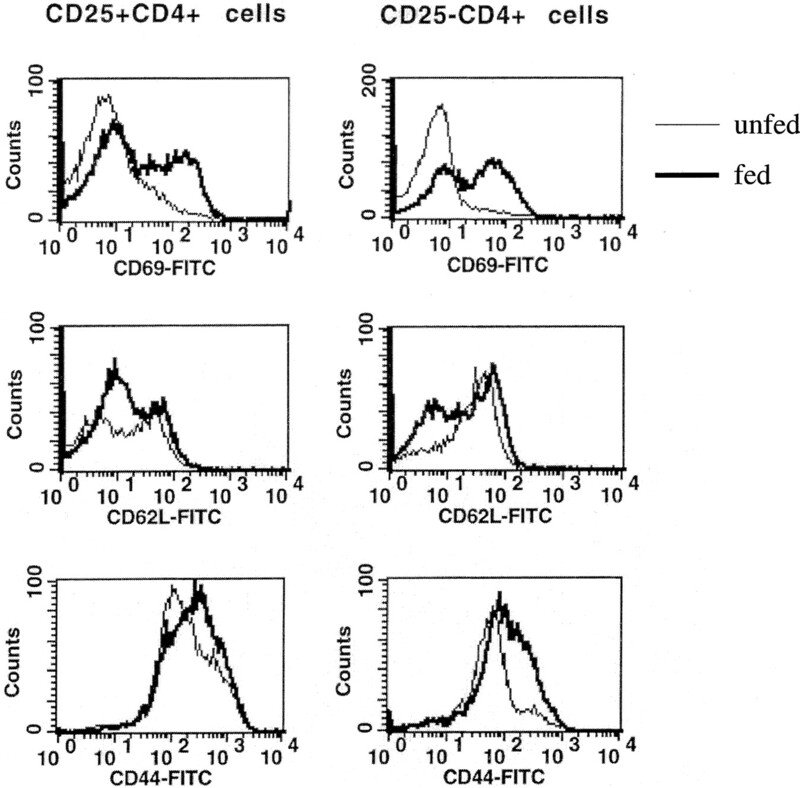 CD25+CD4+ cells from fed mice suppressed CD25−CD4+ cells from unfed mice (Fig. 4⇑B) equally as well as they suppressed CD25−CD4+ cells from fed mice (Fig. 4⇑A). To assess the in vivo activity of CD25+CD4+ regulatory T cells generated by oral feeding, we tested whether CD25+CD4+ T cells from OVA-fed OVA TCR Tg mice could inhibit Ag-specific immune responses when transferred into BALB/c mice. Purified CD25+CD4+ or CD25−CD4+ T cells (1 × 106) from OVA-fed mice were injected i.v. into BALB/c mice. One day later, BALB/c mice were immunized in the footpad with OVA/CFA. DTH responses and in vitro proliferative responses to OVA were measured on day 14. As shown in Fig. 5⇓A, DTH responses were significantly suppressed in mice that received CD25+CD4+ T cells from both unfed and fed mice, but no significant effect was observed in those that received CD25−CD4+ T cells from unfed or OVA-fed mice. As shown in Fig. 5⇓B, in vitro proliferative responses of splenocytes to OVA were also suppressed following transfer of CD25+CD4+ T cells from both unfed and OVA-fed mice, whereas enhancement of proliferation was observed when CD25−CD4+ T cells from both unfed and fed mice were transferred. Ag-specific proliferation in the lymph node and secretion of IL-2 and IFN-γ in lymph node cells and splenocytes were also suppressed in mice receiving CD25+CD4+ cells from fed mice. Furthermore, CD25+CD4+ cells from OVA-fed mice suppressed BSA responses in vitro by only 19% when added to CD25−CD4+ cells from BSA-immunized mice, but if OVA was added, in vitro suppression rose to 72% (Fig. 5⇓C). This is consistent with reports that suppression is triggered in an Ag-specific fashion, but then acts in an Ag-nonspecific fashion (17). DTH reaction and proliferation of splenocytes. A, CD25+CD4+ and CD25−CD4+ T cells from OVA-fed or unfed mice were purified by MACS MicroBeads and immediately injected i.v. into 6- to 8-wk-old BALB/c mice (1 × 106 cells/mouse). BALB/c mice were then immunized with 100 μg of OVA/CFA in the footpads on the following day. The mice were challenged with 20 μl of OVA (1 mg/ml) in PBS in the left ear or 20 μl of PBS in the right ear 13 days after immunization. Ear thickness was measured 24 h later. Δ ear thickness = thickness of left ear − thickness of right ear. Data shown are the results of two independent experiments with values for ear thickness from individual mice (6–8 mice/group). ∗, p < 0.01 vs HBSS, CD25− fed, or CD25− unfed. B, Spleen cells from BALB/c mice receiving HBSS (triangles), CD25−CD4+ T cells from fed mice (open circles), or unfed mice (open squares), or CD25+CD4+ T cells from fed (filled circles) or unfed (filled squares) were prepared on day 14 after immunization and cultured at 5 × 105 cells/well in 10% DMEM with the indicated concentration of OVA. The culture was pulsed 48 h later, and cells were harvested 12 h later. Results are mean values of two experiments. C, BALB/c mice were immunized with 100 μg of BSA in CFA. At day 14 after immunization, CD25−CD4+ T cells from those mice were sorted and then cocultured at 5 × 105/well with purified CD25+CD4+ T cells (1 × 105/well) from OVA TCR Tg mice fed 20 mg/ml OVA in drinking water for 5 days in the presence of APC and 200 μg/ml BSA with or without 200 μg/ml OVA. The culture was pulsed at 72 h and harvested 12 h later. The results are mean values (±SD) of two experiments. To further characterize the properties of CD25+CD4+ T cells from fed vs unfed mice, we analyzed the cytokine profiles of CD25−CD4+ and CD25+CD4+ T cells from unfed and OVA-fed OVA TCR Tg mice. Cells were stimulated by plate-bound anti-CD3 mAb. As shown in Fig. 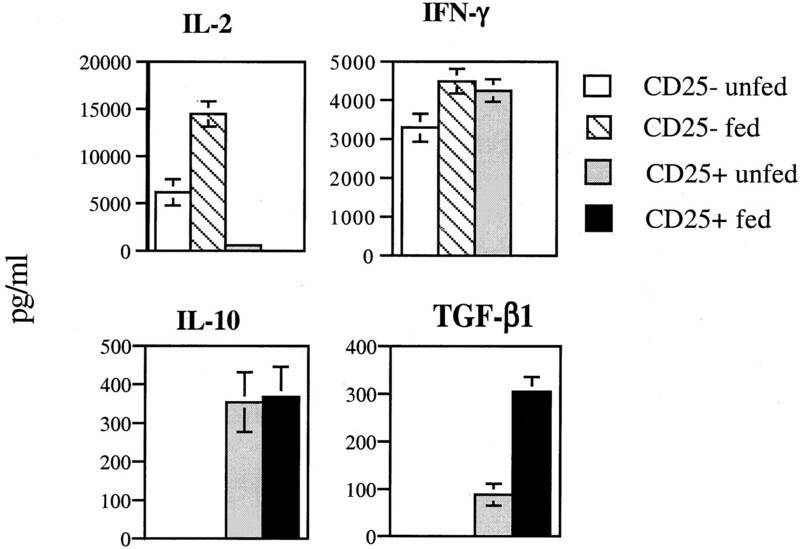 6⇓, CD25−CD4+ T cells from either unfed or fed mice produce IL-2 and IFN-γ, but no IL-10 or TGF-β. CD25+CD4+ T cells from unfed mice produce minimal amounts of IL-2 and similar amounts of IFN-γ as CD25−CD4+ T cells, whereas CD25+CD4+ T cells from fed mice produce neither IL-2 nor IFN-γ. CD25+CD4+ T cells from unfed mice secrete IL-10 and small amounts of TGF-β1 (80 pg/ml), whereas the production of TGF-β1 increases 3-fold (260 pg/ml) in CD25+CD4+ T cells from OVA-fed mice. CD25+CD4+ T cells from both unfed and fed mice secrete similar amounts of IL-10. There was no detectable IL-4 secretion by CD25+CD4+ T cells from either unfed or OVA-fed mice. Cytokine production by CD25+CD4+ T cells and CD25−CD4+ T cells. Purified CD25+CD4+ and CD25−CD4+ T cells (1 × 106/ml) from unfed or OVA-fed TCR Tg mice were incubated with plate-bound anti-CD3 (10 μg/ml) in Ex Vivo 20 medium for 48 h. IL-2, IL-10, IFN-γ, and total TGF-β1 in the supernatants from cell cultures were measured by ELISA. Results (mean ± SD) are representative of three independent experiments. Studies on the role of CD28 in T cell activation demonstrate that cross-linking CD28 can prevent the induction of anergy in T cell clones (33), and that escape of CD25+CD4+ T cells from their anergic/suppressive state following treatment with IL-2 can lead to autoimmune disease (10). Thus we tested the effect of anti-CD28 (5 μg/ml) plus anti-CD3 on CD25+CD4+ T cells from both unfed and OVA-fed mice. We found that anti-CD28 plus anti-CD3 resulted in cell proliferation and enhanced the production of IL-2 and IFN-γ by CD25+CD4+ T cells from either unfed or fed mice (data not shown). These results suggest that inhibition of B7/CD28 signaling or enhancement of B7/CTLA-4 signaling might represent an important step in the generation and maintenance of the anergic state of CD25+CD4+ T cells. Because CD25+CD4+ T cells from both unfed and OVA-fed OVA TCR Tg mice secrete both IL-10 and TGF-β1, we tested whether these cytokines play a role in mediating the suppressor function of CD25+CD4+ T cells in vitro. We first tested anti-TGF-β and anti-IL-10 Ab and found no effect (data shown in Fig. 7⇓A). However, others have reported that role for IL-10 in the function of regulatory cells that inhibits colitis could be demonstrated only by using an anti-IL-10R Ab (34). Thus, we tested the effect of TGF-β sR and IL-10 sR. As shown in Fig. 7⇓B, the in vitro suppressive activities of CD25+CD4+ T cells were partially reversible by the addition of recombinant TGF-β sR or IL-10 sR to the culture medium at a concentration of 10 μg/ml, demonstrating that CD25+CD4+ T cells mediate their suppressive effects, in part, via IL-10 or TGF-β. No additional reversal was observed at doses of 100 μg/ml. However, the mixture of TGF-β sR and IL-10 sR did not completely block the CD25+CD4+ T cell-mediated suppression. Thus, although the suppressive activity of these cells could be shown to involve IL-10 and TGF-β, other mechanisms and factors appear to be involved. IL-10 and TGF-β1 partially mediate suppressive activity of CD25+CD4+ T cells in vitro. CD25−CD4+ T cells (5 × 104/well) from unfed OVA TCR Tg mice were cultured for 72 h either alone (open bars) or with CD25+CD4+ T cells (5 × 104/well) from unfed (gray bars) or OVA-fed mice (filled bars) in the presence of 200 μg/ml OVA plus (A) 10 μg/ml anti IL-10, 10 μg/ml anti-TFG-β, or a mixture of both (B) 10 μg/ml IL-10 sR, 10 μg/ml TGF-β sR II/Fc chimera, or a mixture of both sRs (human IL-3 sR and TNFRI/Fc chimera as controls of IL-10 sR and TGF-β sRII/Fc chimera, respectively). Results are the mean values (±SD) of four independent experiments. CTLA-4 is a CD28 homolog expressed on activated T cells and, upon ligation with CD80 or CD86 on APCs, results in inhibition of T cell activation. Recently, it has been shown that CTLA-4 is constitutively expressed on CD25+CD4+ T cells and involved in mediation of suppressive activity of CD25+CD4+ T cells in vitro and in vivo (21, 22). We then tested the effect of oral Ag on the expression and function of CTLA-4 on CD25+CD4+ T cells. As shown in Fig. 8⇓A, CTLA-4 was expressed on only 0.2% of CD25−CD4+ T cells from unfed mice, which increased slightly to 2.6% following feeding. In contrast, CTLA-4 was expressed on 12.5 ± 2.9% CD25+CD4+ T cells from unfed mice, which increased to 23.5 ± 1.6% in fed mice as measured by intracellular staining. Inhibition of CTLA-4 signaling in vitro by high concentrations of anti-CTLA-4 Ab (100 μg/ml) completely abrogated the suppressive activity of CD25+CD4+ T cells from unfed mice, but only partially reversed suppression by CD25+CD4+ T cells from fed mice (data shown in Fig. 8⇓B). Induction of CTLA-4 expression in CD25+CD4+ T cells by oral Ag administration. A, Sorted CD25+CD4+ or CD25−CD4+ T cells from both unfed and OVA-fed OVA TCR Tg mice were fixed with Cytofix/Cytoperm solution for 20 min at 4°C and then stained with PE-conjugated anti-CTLA-4 (1 μg/106 cells) in 1× perm/wash solution for 30 min on ice. The cells were analyzed immediately by flow cytometry. B, CD25−CD4+ T cells (5 × 104 well) purified from unfed mice were cultured for 72 h either alone (open bars) or with the same numbers of CD25+CD4+ T cells from unfed (gray bars) or OVA-fed (filled bars) mice in the presence of 200 μg/ml OVA, APC (1 × 105/well), 10 μg/ml anti-FcR, and isotype control or 100 μg/ml anti CTLA-4. In the present study, we demonstrate that oral administration of OVA to OVA TCR Tg mice activates CD25+CD4+ regulatory T cells in an Ag-specific fashion as oral BSA had no effect. Although the CD25+CD4+ T cells from orally fed mice are similar to CD25+CD4+ regulatory T cells from naive mice in their anergic and regulatory properties, we found differences. Compared with CD25+CD4+ T cells from unfed mice, the capacity of CD25+CD4+ T cells from OVA-fed mice to suppress the in vitro stimulation of CD25−CD4+ T cells is enhanced 3- to 4-fold. Furthermore, CD25+CD4+ T cells from fed mice secrete more TGF-β1 after anti-CD3 stimulation than CD25+CD4+ T cells from unfed mice and do not secrete IFN-γ, whereas unfed CD25+CD4+ T cells do. Others have reported that CD25+CD4+ T cells require activation in vitro to exert their suppressive function (10, 17). We found that mucosal administration of Ag might provide an effective in vivo method of activating regulatory CD25+CD4+ T cells for fully immunosuppressive effects. We also demonstrate that TGF-β and IL-10 appear to play a partial role in the suppressive properties of CD25+CD4+ T cells in vitro. CD25+CD4+ regulatory T cells were first described by Sakaguchi et al. (1) and Taguchi and Nishizuka (2). Since then a great deal has been learned about their function and suppressive properties both in vitro and in vivo. Sakaguchi’s group (8, 10, 13, 19, 25) has shown their importance in preventing the development of autoimmune disease and their dual property as anergic and suppressive cells. They have shown that removal of this population may induce tumor immunity (14, 15) and that CD25+CD4+ regulatory T cells may require CTLA-4 but not CD28 as a costimulatory molecule for functional activation (20). Shevach’s group has also investigated this regulatory T cell population and found that CD25+CD4+ T cells represent a unique lineage of immunoregulatory cells (9) that can suppress polyclonal T cell activation in vitro by inhibiting IL-2 production (11). They have also defined the specificity of CD25+CD4+ cells in a postthymectomy autoimmune gastritis model (16). In terms of mechanism of action, they have reported that the suppressor effector function of CD25+CD4+ immunoregulatory T cells requires activation via the TCR to become suppressive, but once activated, the suppressor function is nonspecific (17). Although it is clear that CD25+CD4+ regulatory T cells have potent in vivo and in vitro biologic effects, the precise mechanism of action and induction in vivo remain to be defined. Read et al. (21) report that CTLA-4 plays an important role in the function of CD25+CD4+ cells that control intestinal inflammation. Cederbom et al. (24) have suggested that CD25+CD4+ regulatory T cells down-regulate costimulatory molecules on APCs, and Salomon et al. (22) report that B7/CD28 costimulation is essential for the homeostasis of CD25+CD4+ immunoregulatory T cells that control autoimmune diabetes. It has also been reported that regulatory CD4+ cells that express IL-2Rα-chain (CD25) are resistant to clonal deletion (12). Our findings demonstrate that CD25+CD4+ T cells with potent immunoregulatory function are activated following oral Ag administration. Their suppressive properties in vitro are partially dependent on IL-10 and TGF-β. Recently, Annacker et al. (35) showed that naive CD25+CD4+ T cells regulate the expansion of peripheral CD4 T cells through the production of IL-10 because CD25+CD45 RBlowCD4+ cells from IL-10-deficient mice do not protect from wasting disease induced by naive CD45RBhighCD4+ T cells. It has been reported that CD25+CD4+ regulatory cells produce IL-10 and are resistant to deletion in vivo (12). Sakaguchi (8) has reported that there is increased expression of IL-10 and TGF-β message in CD25+CD4+ T cells, and Powrie reports that CD45RBlowCD4+ T cell-mediated suppression of colitis also involves IL-10 (34) and TGF-β (36), although the latter could only be shown in vivo. However, Shevach’s group (17) did not identify any known cytokine-mediated mechanisms in their studies even though they reported that the effector mechanism is nonspecific. Our finding that the use of IL-10 sR and TGF-β sR was required to show a partial in vitro effect is consistent with the experience of Powrie (34) in the colitis model. Nonetheless, a complete understanding of the precise mechanism of action of these cells remains to be determined by further in vivo testing and cloning of the cells. 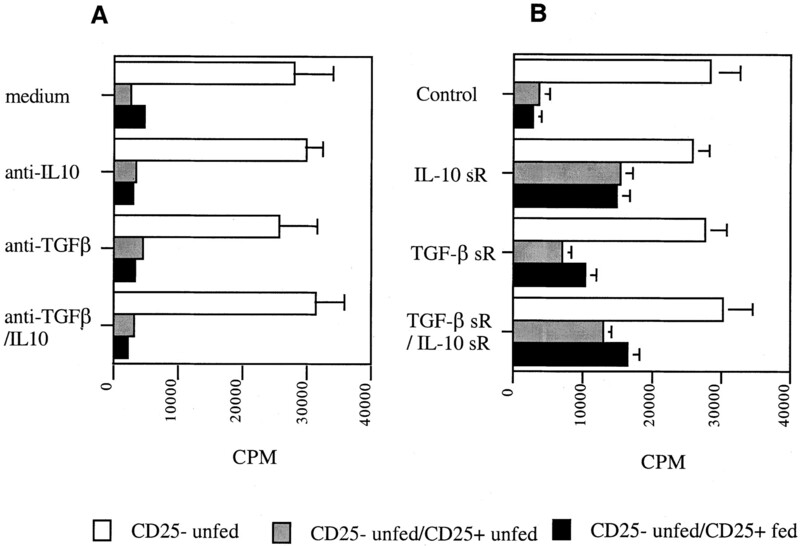 The enhanced suppressive effect of CD25+CD4+ T cells from fed mice did not seem to be related solely to TGF-β or IL-10 as there was equivalent partial reversal by IL-10 sR or TGF-β sR neutralization in both populations. However, CD25+CD4+ T cells from fed mice have a higher proportion of CTLA-4-expressing cells, which could explain the difference. It is likely that CD25+CD4+ regulatory T cells comprise different subpopulations depending on how they are isolated and the function being tested. Regarding oral tolerance, we have previously shown that orally administered Ag induces TGF-β-secreting regulatory cells termed Th3 cells (37). An important question is the relationship of Th3 cells to the CD25+CD4+ T cells reported here. Like orally induced CD25+CD4+ T cells, Th3 cells are resistant to deletion (28). There is no phenotype marker (e.g., CD25) for Th3 cells as there is for CD25+CD4+ regulatory cells. Of note, in our study we only observed an increase in CD25+CD4+ T cells when a high dose of Ag was placed in the drinking water or was gavaged to OVA TCR Tg mice. We did not find a similar increase when naive mice were fed and subsequently immunized even though TGF-β-secreting Th3 cells can be induced by low-dose feeding followed by immunization in normal mice. Furthermore, the suppressive effect of Th3 cells are easily reversed in vitro with anti-TGF-β Ab, something we did not observe with induced CD25+CD4+ cells even though there was partial reversal with TGF-β sR. Thus, it appears that orally induced CD25+CD4+ regulatory cells are distinct from the Th3 cells we have described, although they both can be induced in the gut following orally administered Ag, and depend in different ways on TGF-β for their effector functions. These observations suggest that there are unique properties in the gut that lead to the generation of both orally induced CD25+CD4+ regulatory cells and Th3 type regulatory cells. This could be related to the local milieu in the gut and costimulatory molecules such as B7.2, because Th3 cells are preferentially generated by CD86 costimulation (38). Furthermore, the gut appears to preferentially lead to expression of CTLA-4, and we have observed that CTLA-4 may be involved in some forms of oral tolerance (39). It has been shown recently that cell contact-dependent suppression by CD4+CD25+ regulatory cells is mediated by cell surface-bound TGF-β (40). Although one can generate CD25+CD4+ cells following i.v. administration indicating cell activation, this phenotype does not persist and these CD25+CD4+ cells do not have suppressive properties. Similarly, inducing CD25 in vitro on CD25− cells does not induce a suppressive phenotype (11). An important question regarding expansion of CD25+CD4+ T cells following oral Ag is whether oral Ag induces CD25+CD4+ regulatory cells de novo or expands an already existing cross-reactive regulatory T cell population. This question is currently being addressed in our laboratory by oral Ag administration of OVA TCR Tg mice on the RAG−/− background. In a recently published paper, Thorstenson and Khoruts (41) transferred T cells from RAG2−/− DO 11.10 mice to BALB/c mice and reported the generation of anergic and potentially immunoregulatory CD25+CD4+ T cells in vivo after induction of peripheral tolerance with i.v. or oral Ag. In preliminary experiments, we have found that directly feeding DO 11.10 mice on the RAG2−/− background led to increased numbers of CD25+CD4+ cells, and spleen cells from fed animals produced less IL-2 and had decreased proliferative responses as compared with unfed mice. Thus it appears that oral Ag may be inducing CD25+CD4+ regulatory cells de novo, through more studies are required in this area. Our findings identify an approach by which CD25+CD4+ regulatory T cells can be activated in vivo which provides an avenue for further understanding of both the biology of CD25+CD4+ T cells and mechanisms of oral tolerance. ↵1 This work was supported by National Institutes of Health Grants AI43458 and N538037. ↵3 Abbreviations used in this paper: MBP, myelin basic protein; Tg, transgenic; ILN, inguinal lymph node; MLN, mesenteric lymph node; PP, Peyer’s patches; CD62L, CD62 ligand; sR, soluble receptor; DTH, delayed-type hypersensitivity.